Never clean up vomit again! Perfect for motion sickness, nausea, road trips & more! How far is the restroom when you get that sudden "I feel sick" sensation? Don't worry about it anymore! The CareBag® Vomit Bag from Cleanis will effectively catch and contain all vomit mess and spare you the trouble of cleaning up your clothes, car, carpet or floor! 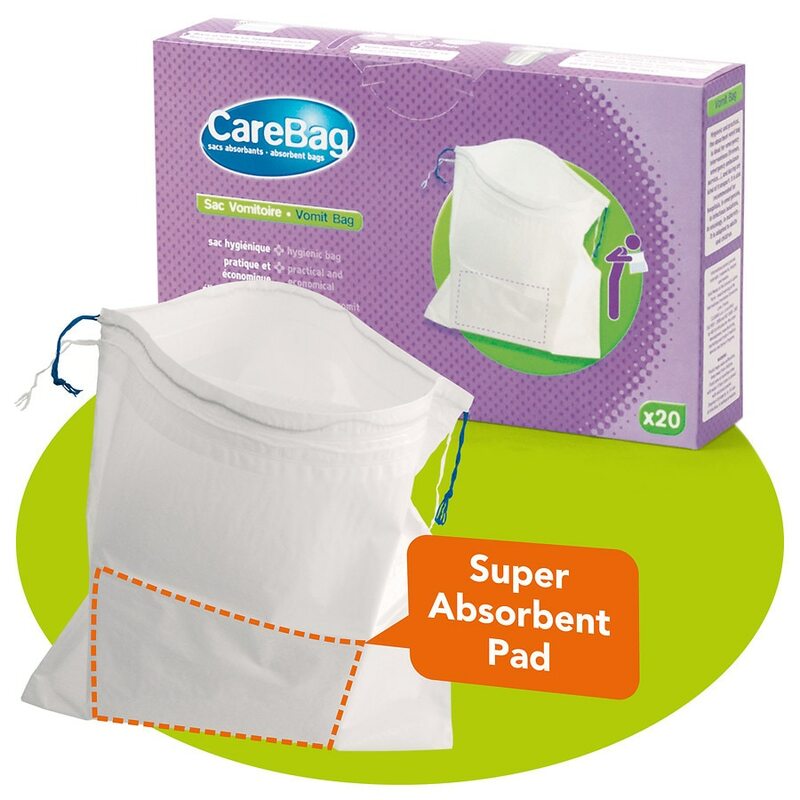 Our CareBag® Vomit Bag is a medical grade bag equipped with a unique super absorbent pad, which turns up to 16oz of emesis into a gel within seconds. It is designed for both children and adults, and it is the ideal solution for people subject to motion sickness, morning sickness, vertigo, post-surgery, chemotherapy, etc. Keep one with you at all times! Open box and take a bag. Open the bag, hold it with both hands and vomit directly into the bag. Body fluids turn into gel within seconds. To close: Hold the white string in one hand and the blue string in the other hand pull tightly and tie a knot. Dispose of the sealed bag in your household waste just like diapers. DO NOT FLUSH. Plastic bag can cause suffocation, keep away from children. Flush eyes or sensitive areas with water if they come in contact with enclosed powder. Dispose of properly, or, in case of infection, in biohazard wastes.